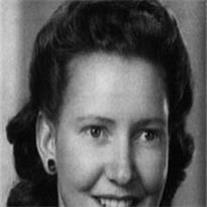 Fay Guynn, 87 passed away April 17, 2009 in Mesa, AZ. She was born February 25, 1922 in Kenilworth, UT. She was raised in Utah and Idaho. She was trained as a school teacher and worked at the Phoenix Public Library and retired from Macy’s after 24 years. She was an active member of the LDS Church and was truly a loveable, great person. She is survived by her husband of 68 years, William Guynn, Jr. four children, 12 grandchildren and many great-grandchildren living in Arizona, Alabama, Iowa and Idaho. Funeral services are Saturday, April 25 at 12:00 noon, preceded by a visitation at 10:00 AM, both at the LDS Meadowgreen Ward, 851 S. 32nd Street in Mesa. Arrangements by Bunker’s Garden Chapel, 480-696-6883.